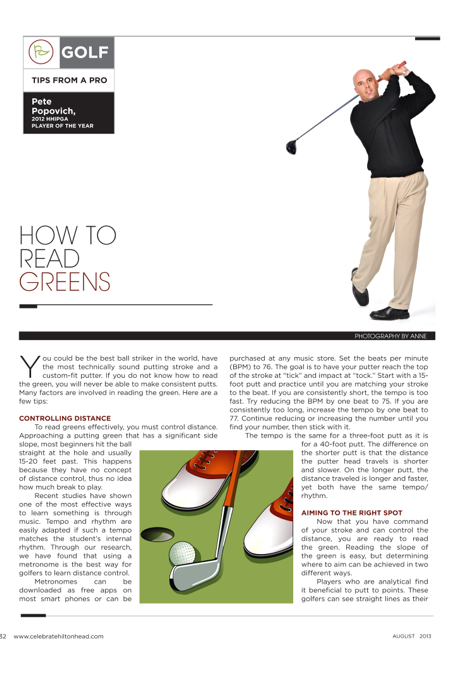 To read greens effectively, you must control distance. Approaching a putting green that has a significant side slope, most beginners hit the ball straight at the hole and usually 15-20 feet past. This happens because they have no concept of distance control, thus no idea how much break to play. Recent studies have shown one of the most effective ways to learn something is through music. Tempo and rhythm are easily adapted if such a tempo matches the student’s internal rhythm. Through our research, we have found that using a metronome is the best way for golfers to learn distance control. Metronomes can be downloaded as free apps on most smart phones or can be purchased at any music store. Set the beats per minute (BPM) to 76. The goal is to have your putter reach the top of the stroke at “tick” and impact at “tock.” Start with a 15-foot putt and practice until you are matching your stroke to the beat. If you are consistently short, the tempo is too fast. Try reducing the BPM by one beat to 75. If you are consistently too long, increase the tempo by one beat to 77. Continue reducing or increasing the number until you find your number, then stick with it. The tempo is the same for a three-foot putt as it is for a 40-foot putt. The difference on the shorter putt is that the distance the putter head travels is shorter and slower. On the longer putt, the distance traveled is longer and faster, yet both have the same tempo/rhythm. Now that you have command of your stroke and can control the distance, you are ready to read the green. Reading the slope of the green is easy, but determining where to aim can be achieved in two different ways. Players who are analytical find it beneficial to putt to points. These golfers can see straight lines as their brains work very well with points, lines and angles. They know how to aim at a spot left and short of the hole, yet stroke it firmly enough to reach the hole. Creative and artistic-minded people typically see the entire path the ball will take to the hole. They see in curves and arcs as opposed to straight lines. It is beneficial for creative people to imagine the hole as a clock with 12 furthest away and 6 closest. Depending on the slope, they would see the putt falling into the hole at a “time.” For example, a right-to-left putt might be 4 o’clock and a left-to-right putt 7 o’clock. Creative people can then look at that “time,” and their subconscious minds will calculate how far to aim. You are either an analytical putter or a creative putter. You cannot be both. Knowing which way the grain of the grass is growing is an important factor when calculating how much break there is to your putt and how to play the shot. Bermuda grass, indigenous to the Southeast, has a strong grain, which can either aid or inhibit the ball from moving in a certain direction. To determine how the grain is growing, look at the hole and notice where the wear marks are. If the left side of the hole is worn, the grain is growing to the left and will alter the putt by pulling it in that direction. If the hole is worn on the far side of the hole, it is down grain, and the putt will be faster. If the wear marks are on the side of the hole closest to you, you are into the grain and the putt will be slower. If you would like to know more about how to read greens and become a better putter, contact the GPA-HHI by calling us at (843) 338-6737 or e-mailing pete@golfacademyhiltonhead.com. Follow us on Facebook at Golf Proformance Academy-Hilton Head, YouTube at GPA Hilton Head or Twitter @GPAHHI.